The “three-horned face” was discovered in 1888 in Wyoming by John Bell Hatcher and described by Othniel Charles Marsh in 1889. 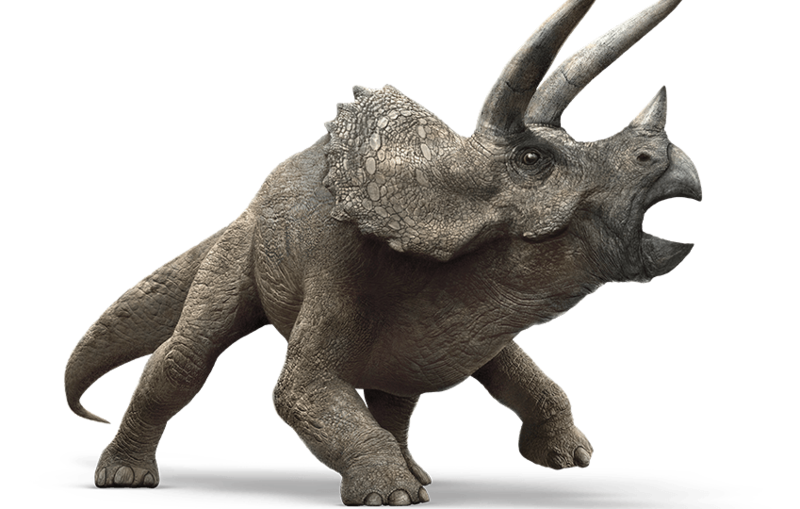 Triceratops lived during the Late Cretaceous Period about 67 to 65.5 million years ago. It was 10.5 meters (35 ft) in length, 4.5 meters (15 ft) in height at the top of crest and 7 tons in weight. It is worthy of notation that this is ridiculously large for a T. horridus specimen and it would appear some Jurassic Park Triceratops are very old individuals. Triceratops was a member of the Ceratopsidae and has been found in the Lance Formation (Wyoming), Hell Creek Formation (North Dakota, South Dakota, Montana), Laramie Formation (Colorado) United States; Scollard Formation (Alberta), Frenchman Formation (Saskatchewan), Canada. There has been recent debate (Though which started over 100 years ago) between the validilaty of Torosaurus and it being sunk into Triceratops. Dr. Jack Horner has pushed some new light into the debate. He claims that that Torosaurus represents mature forms of Triceratops. However, this is generally not accepted yet in the scientific field and more research is needed, though a mounting body of evidence already contests it. 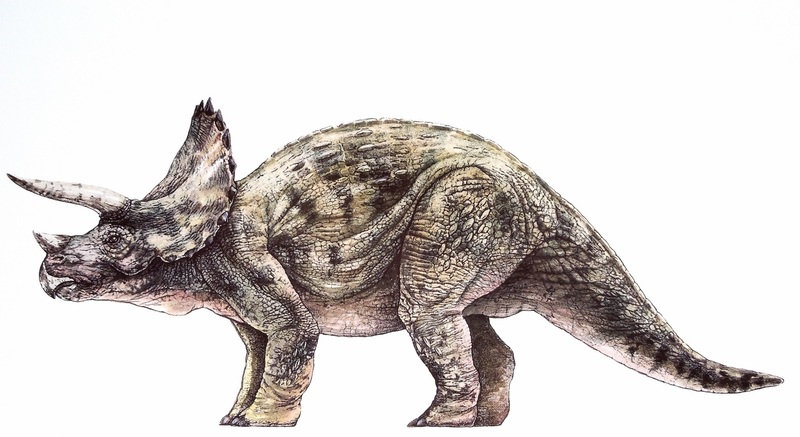 Jess Harding, and the field notes of Dr. Laura Sorkin, however, seem to reinforce this idea and both claim that Torosaurus is actually the adult form of Triceratops, meaning that these two are actually the same species. Though, given Jess had gotten this information from Sorkin (who has proved to be a somewhat unreliable source given her lingering vitriol towards Henry Wu), and even confirmed mature animals such as Lady Margaret are classically Triceratops, and further, the Jurassic World site lists the size of Triceratops at 10 feet tall and 30 feet long, the size of an expected fully mature animal. Thus, the exact canon status of this animal in comparison to Torosaurus remains ambiguous at best, as in real life. Triceratops was one of the most abundant dinosaurs in the late Cretaceous. It was possibly a main source of food for Tyrannosaurus. Undescribed remains of a partially mummified Triceratops indicates that quills formed at the tail, similar to Psittacosaurus. Despite their fearsome appearance, they’re really quite docile except if provoked. If Torosaurus is a Triceratops, then the Triceratops in Jurassic Park are all sub-adults. Triceratops can be found on both Isla Nublar and Isla Sorna. A sick Triceratops was seen in the park tour, taken care of by Gerry Harding. 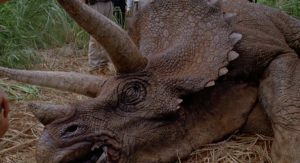 On Isla Sorna, a Triceratops was seen in the Harvester Encampment, captured by the Harvester Team. Nick Van Owen freed the dinosaurs, including the Triceratops from their cages using bolt cutters. The Triceratops broke free from the cage after it was freed, crashing through the Audio Visual equipment tent. The Kirbys used a Beechcraft airplane in the rescue mission in 2001 to fly to Isla Sorna. While the plane is flying over the island, a herd of Triceratops may be seen grazing in the field below alongside herds of other dinosaurs. The Jurassic World theme park on Isla Nublar housed infant Triceratops and adult Triceratops separately. Adult Triceratops are housed in an attraction named ‘Triceratops Territory’, as well as the Gyrosphere Valley. Infant Triceratops were housed in the ‘Gentle Giants Petting Zoo’, an attraction that allowed visitors to Jurassic World to pet and feed the animals. Visitors have the option to pay five dollars to obtain dinosaur feed from a vending machine. In addition, the attraction also allowed guests to ride baby Triceratops among other dinosaurs. 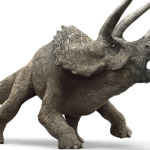 According to the in-universe Jurassic World site, Triceratops love getting scratched behind their frills. The site also includes warnings for visitors to take off their straw hats otherwise Baby Triceratops might eat them. The in-universe Jurassic World site also describes the Triceratops as belonging to the “least aggression” category, which clashes with other portrayals of the animal as short-tempered; however, Asset Containment Unit workers are heard in the film itself lamenting that “the baby Trikes are fighting again” and that the only way to separate them is by tranquilizing and physically moving them; further, the workers in the Gentle Giants Petting Zoo are seen paying exclusive attention to the Triceratops to the exclusion of the other animals, constantly keeping the young Trikes’ attention. Currently, the reason for this contradiction between the way Jurassic World presents itself to the public via the in universe promotional site, and the animals’ actual behavior in film, remains ambiguous and officially unexplained. Several of the juveniles are seen during the events of Jurassic World in the aforementioned petting zoo when Zach and Gray Mitchell pass by during their tour of the park, among the petting zoo’s other inhabitants, albeit briefly. At least one adult is seen- again by Zach and Gray- during their ride in the Gyrosphere, where Zach’s decision to accelerate the Gyrosphere manually prompts the Triceratops and the attraction’s other inhabitants to stampede (albeit keeping quite clear of the Gyrosphere itself). Triceratops are seen one final time, once again the juveniles in the Gentle Giants Petting Zoo, when the released inhabitants of the Aviary descend upon the visitors. One overly-ambitious Pteranodon attempts to fly off with one of the youngsters, which calls helplessly as it is lifted off the ground by its saddle- until it proves too heavy to carry off, whereupon it is roughly dropped about five feet.